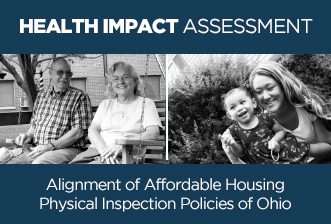 The Office of Affordable Housing Research and Strategic Planning was awarded a generous grant from the Health Impact Project, a collaboration of the Robert Wood Johnson Foundation and The Pew Charitable Trusts to conduct a health impact assessment (HIA). The HIA will inform the revision of compliance rules and policies for housing inspections, both within OHFA's state-level compliance standards, and at the federal level. The HIA will also guide decisions on a proposal to improve interagency coordination and streamline the current system for housing inspections on affordable housing units. At present, different inspections are conducted or required by local housing authorities, the U.S. Department of Housing and Urban Development (HUD), the Internal Revenue Service, and the U.S. Department of Agriculture (USDA). Housing inspections help identify and remedy substandard physical conditions, like water leaks and mold, pests, peeling paint, and structural hazards which can contribute to a wide range of health problems including asthma, injury and burns, and mental illness. Findings from the HIA will be used within OHFA and the federal Rental Policy Working Group to inform the final proposed language for the physical inspection regulations. This project is a collaborative effort between the Office of Affordable Housing Research and Strategic Planning, The Ohio State University, College of Public Health, the Ohio U.S. Department of Housing and Urban Development, USDA Rural Development offices, and the Coalition on Homelessness and Housing in Ohio. To learn more about HIAs and Housing, read Taking Health Into Account at Shelterforce. For more information about the Health Impact Project, visit www.healthimpactproject.org.